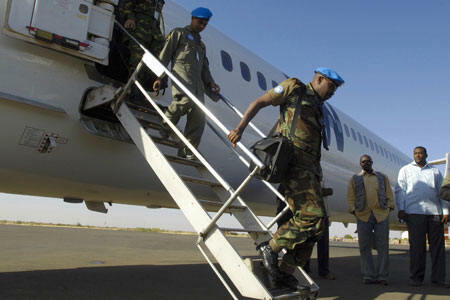 UNITED NATIONS, December 31 -- Today responsibility for peacekeeping in Sudan's Darfur region passes to the UN-African Union hybrid mission created by a resolution of the Security Council on July 31, UNAMID. Rather than the projected 26,000 troops, it begins with barely nine thousand. None of the called-for helicopters have been provided by member states. And in a little-noticed section of the UNAMID budget resolution, adopted in an all-night session of the General Assembly on December 21, the UN's $250 million no-bid contract with Lockheed Martin for Darfur infrastructure was criticized, and an investigation called for. "30. Requests the Secretary-General to entrust the Office of Internal Oversight Services to undertake a comprehensive review of the use of the extraordinary measures for this mission..."
To recap, the "single source contract without competitive bidding" referred to was for $250 million, to Lockheed's subsidiary Pacific Architects & Engineers. After the deal was announced on October 15, Inner City Press twice asked Ban Ki-moon to explain the lack of competitive bidding. He responded by promising transparency; his spokesperson's office explained that following the Security Council's July 31 resolution on UNAMID, requiring the UN to take responsibility for Darfur by year's end, there had been no choice but Lockheed. But then whistle-blowing UN staffers showed Inner City Press an earlier letter, from April, from the head of the UN's new Department of Field Support, Jane Holl Lute, pushing Lockheed Martin's PAE for a sole source contract. The incongruity was subsequently raised in the General Assembly's budget (Fifth) committee, by speakers ranging from the African Group to Russia and even Canada, but was never publicly explained. The budget committee and General Assembly cannot have been convinced by explanations provided behind closed doors, either: on December 21, the full Assembly, even in compromise language, criticized the contract and called for an investigation of the lack of competition. Despite numerous requests, Jane Holl Lute never came to a briefing to answer questions -- although she did write a December 26 letter to the editor of the Washington Post arguing that reports of corruption in peacekeeping procurement were overblown. Inner City Press has spoken on background with UN officials involved in the Sudan. Requesting anonymity in order not to be fired, these officials have complained for example that the UN has at least 21 helicopters elsewhere in Sudan that it is not moving to Darfur. Others have complained that the UN mission on south Sudan, UNMIS, stands alone in allowing national staff to view so-called coded cables, a practice they say began under then-envoy Jan Pronk. While 140 Chinese engineers are already in Darfur, because flying their water-drilling equipment in on Antonov cargo planes was deemed too expensive, it is en route literally on a slow boat from China. A diplomat involved in the budget negotiations recounts other procurement irregularities, up to sourcing needed water even by air through the UN base in Brindisi, Italy, rather than closer-by. "It's a comedy of errors," this diplomat told Inner City Press at year's end. Only nobody is laughing.